Whether you’re building apps for the browser, mobile or desktop, Aurelia can enable you to not only create amazing UI, but do it in a way that is maintainable, testable and extensible. Aurelia is a project of Rob Eisenberg, the author of a very popular MV * – framework for Caliburn.Micro XAML-platforms, Durandal. Understanding all the disadvantages of Durandal, Eisenberg engaged in the development of so-called NextGen framework. In 2014 he began to work in Angular team on the second version of the framework. However, several months later, Rob decided to leave the Angular team since the direction of Angular 2, in his opinion, had changed a lot. He gathered a large team and returned to work on the framework of his dreams. And Aurelia is the result of that work. By using modern tooling Aurelia was written from the ground up in ECMAScript 2016. This means you have native modules, classes, decorators and more at disposal. Aurelia’s code is open sourced under the MIT License, a very permissive license used by many popular web projects today. The starter kits are available under the Creative Commons 0 license. There is also a Contributor for those who wish to join the team in working on Aurelia. Ultimately, this means that you can use Aurelia without fear of legal repercussions and it can be build in the same confidence. • Convention over Configuration – Simple conventions help developers follow solid patterns and reduce the amount of code they have to write and maintain. It also means less fiddling with framework APIs and more focus on their app. • Simple, But Not Simplistic – Because of the simple design developers are able to learn a very small set of patterns and APIs that unlock limitless possibilities. • Promotes the “-ilities” – Testability, maintainability, extensibility, learnability, etc.- Aurelia’s design helps developers to naturally write code that exhibits these desirable characteristics. • Amazingly Extensible – Aurelia is highly modular and designed to be customized easily, so developers will never hit a roadblock or have to “hack” the framework to succeed. • Integrates Well with Others – Easily integrated with any 3rd party library or framework: for instance, with jQuery, React, Polymer, Bootstrap, MaterializeCSS and much more. • TypeScript Support – Each Aurelia library is released with its own d.ts files. There are also official TypeScript beginner kits and production quality starter kits. • An Official Product with Commercial Support – Being an official product of Durandal Inc., it has commercial and enterprise support available, so you can use Aurelia for building core technology for your business. 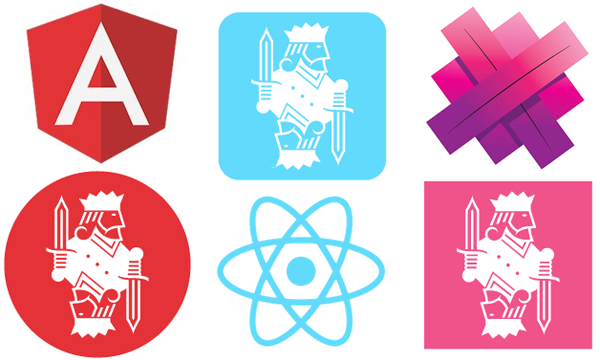 Aurelia, Angular and React.js – what’s common and what’s different? Two-way binding is provided out of the box and the framework does so very precisely. By default, 1-way databinding is used except for form controls, a clear plus when compared to React. Do keep in mind that two-way data binding can only be done through explicit syntax, as is the case in Angular 2. The learning curve for Aurelia is comparable to that of Angular 2 and thus a lot steeper than React’s. Luckily, the extensive documentation makes up for that a great deal. Angular 2 and Aurelia Architecture is very similar. Aurelia looks a lot like Angular 2 in the sense that it’s a complete framework that relies on the web standards. It’s as pluggable as React is and as Angular 2 will be. While Angular was created by Google and React by Facebook, they don’t provide commercial or enterprise support, something that Aurelia will do. Aurelia offers ES6-support out of the box and supports all forms of alternative abstraction syntax such as TypeScript and CoffeeScript. Migration documentation about migrating from Angular 1 and 2 have been put on the roadmap. The basis of both Angular 2 and Aurelia application comprise components associated with the corresponding template. The syntax is much simpler and more explicit (i.e. self-explanatory) than Angular 2 and looks a lot like standard JS syntax. ES6 and JSPM are used by default and a gulp file with a custom-built system to transpile ES6 to ES5 using the Babel transpiler is included in the standard package. Aurelia also uses conventions instead of its own syntax and boilerplate code. No special characters like the ones in Angular 2 (*, (),  en #) here. Aurelia is built in a modular way making it very pluggable. You can plug in internationalization, routing, virtualization, animation, … Besides that, third party plugins are available as well such as the aurelia-flux plugin adding the Flux dispatcher to Aurelia. The presence of a root-component is necessary; it represents an application (app). The metadata may / should be attached to components by using decorators. Component initialization is performed by using dependency injection. In addition, each component has a declared lifecycle, which can be built by using the lifecycle hooks. The components may be formulated into a hierarchical structure. Communication between the component and the template is performed by using data binding. The process of template rendering to the final HTML can be integrated by using pipes (Angular) or value converters + binding behaviours (Aurelia). The main advantage of Aurelia in comparison to Angular is an advanced composition mechanism and template parts. Aurelia is designed with an emphasis on unobtrusive, the number of framework structures in the final code is minimal. Aurelia is more compact, while Angular sometimes simply forces to produce copy-paste. Aurelia is new to the market while Angular has a big user base because it’s already been around for 6 years. On the other hand, Aurelia has great documentation available, it’s an official product of Durandal Inc, and the company has a long term vision for the product, something the Angular team doesn’t seem to have and is blamed for a lot. While on the surface it might not seem fair to compare Aurelia to React.js, they’re both being used for the same things. Despite the fact that React.js is a fully-fledged and functionally released product without the early preview alpha tag and Aurelia is not, at current stage they are both pretty at the same level. You can achieve the same tasks within both, just in different ways. As for React components and Aurelia’s ViewModel’s, they are both quite similar in that you’re essentially using a class to define properties and methods bound to a particular view. The primary difference between them is React doesn’t separate the logic from the view, meaning in React the View and ViewModel are both within the same file. However, that’s not to say that Aurelia doesn’t allow you to achieve the same thing by rendering the View from within the ViewModel as well and forgoing a traditional View. The original intent behind React.js was not to be a competitor to the likes of Angular or Aurelia, but rather be the library that everyone uses with their SPA framework like Angular to improve performance. Therefore, this means you can easily use React.js within Aurelia. Aurelia and React.js can be used together and in doing so, it provides you with a level of power other frameworks cannot without subsequent complexity and strict convention like EmberJS. It goes without saying why these three frameworks are so popular. They all have a lot of strong advantages. Eventually, I’m favoring Aurelia: there’s solid documentation available and the overall philosophy is the same with Angular 2, but Aurelia is a better choice from the syntax and execution point of view. The architecture and syntax vision of Aurelia team seems to be more clear than the vision of the Angular team. The company and enterprise support of Aurelia is also a big pro. What is your personal experience with these frameworks? Which one would you choose for your projects and why? What’s your prediction “who” will win the crown in the nearest future? Please feel free to share your thoughts with us. Previous postSitefinity & Sitecore: let’s try to choose more proper one for your business needs. Nice writeup and comparison, Darya. I have been working with Aurelia practically since it was announced, I was fortunate enough to be in a situation where I was starting a new project and open minded enough to choose something new. At the time, I was already quited heavily invested into the React.js/Flux methodology ecosystem, so I could have quite easily just picked React and it still would have been a solid choice. Other choices on my list at the time were Angular 2, Angular 1 and Ember. These choices were on the list no because I liked them, but I wanted to be open minded and choose the right one. Almost immediately NG1 and NG2 were scrubbed off the list. Ember is a great framework, absolutely solid, but it is strongly opinionated with its conventions and I hate working with overly opinionated libraries/frameworks, because it makes switching that much harder. Nonetheless, I ended up choosing Aurelia and for the better part of a year have been working on quite a complex and large-scale application with it. Eventually with frameworks and libraries the honeymoon period wears off and the abusive nature is revealed. However with Aurelia, the honeymoon period is still happening and Aurelia treats me right. I am still excited to work with this framework everyday. Not only that, but I get to see developers on my team get excited as well and now I also live through the excitement of other developers working with it. I think at present people are put off by the lack of RC title, but really, it’s just a title and Aurelia is just as fast and stable as any other framework out there. So once it hits release candidate 1 and eventually a stable release, I think we will be seeing a whole lot more people flood into the ecosystem which has grown greatly in the last 6 months alone. Thank you very much for sharing your opinion and experience, Dwayne. I really appreciate it. At Altabel we also have been working with a number of JS frameworks. If you want to continue our discussion, feel free to contact me directly at e-mail: darya.bertosh@altabel.com| skype: darya.bertosh. Thanks for sharing your thought! We are currently using NG1. Also in the way of comparing different Frameworks. Need to choose one between NG2, React+Redux and Aurelia. We choose NG1 2 years ago because it has really big community support that we could find great help from Stack-overflow and all kinds of directives from Github. What do you think about Aurelia’s community support now?